Isn’t it obvious that all this is designed to make Trump distrust everyone around him? Isn’t that a way to drive him toward that “crazy” where they say he already is, and which is fallback grounds for impeachment when the Mueller investigation fails to come up with nothing more serious than the fact that Russian intelligent agents are intelligent agents? (TLB) published this article by Diana Johnstone with permission from where it appeared at The Ron Paul Institute. 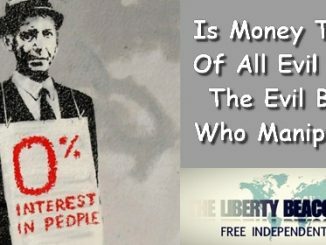 Is Money The Root Of All Evil Or Just The Evil Bankers Who Manipulate It?